Should I have a structured or a free flow journal? Home/Journal FAQs/Should I have a structured or a free flow journal? If you have recently started to keep a daily journal, you most certainly have pulled your hair out in trying to decide between following a rigid structure or template vs free flow journaling. With a rigid structure, you would attempt to write articulated thoughts in a similar manner whereas with the free flow journaling you would write anything that comes to your mind – something like the image below. It is important to remember the core goal of keeping a daily journal – to enhance your mental state. For example, writing your goals down so you can increase the chances of accomplishing them or writing out your fears and worries so your mind is not in an endless loop. With that goal in mind, there is a simple three-step process you can follow to get better at keeping a journal which has the best of both worlds – structured and free flow. I like to call this process write, reflect, and repeat (yes, simplicity is the key). 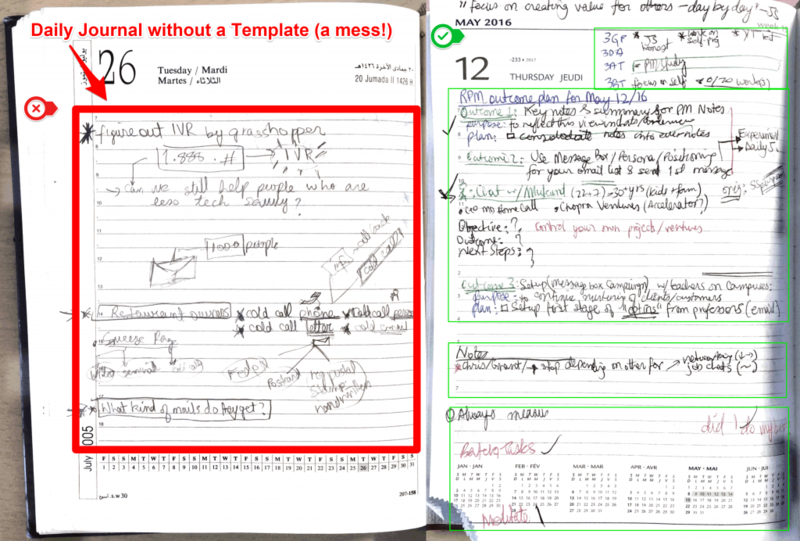 When faced with the dilemma on how to structure your journal, resist the temptation to decide on a fixed template (e.g my template) because that will be unnatural to the workings of your mind. To be natural to your mind, you need to first write anything and everything on your mind for at least 2+ months. Simply pick up a pen each day and write anything and everything you want in the daily Journal – regardless of how messy it gets. If you run out of pages, just add more pages or use post-it notes. This step can be very difficult to follow because it may seem like a total mess. However, it is very important to you do this or otherwise you will never know what role a journal is playing for your mind. By now, you have at least two months’ worth of journal entries that you can reflect on peacefully. Your goal is to categorize each entry (or a line) on each page of the journal under a label. For example, if you are asking yourself from philosophical questions, you can label it as “Soul Searching”. I like to use a multi-coloured pen where each colour is associated with a category and I underlined the text that matches it. My categories/labels/themes include (or included); daily tasks, self reflection, long-term planning, and goals broken up by different areas of life. Once you have everything colour-coded, now is when you decide what to keep in the journal and what should have a new home outside of the journal. For example, upon reflecting, I realized that I was writing a lot about long-term goals (2+ years) scattered all over the journal. Such long-term planning was not a wise idea to do in a “daily” journal because it would get lost or I would forget which would mean I would end up rewriting it. Thus, by the process of elimination (but only after letting your mind free flow) you can begin to structure your journal – while also taking care of what you will no longer be writing down. Unfortunately, the step 1 and 2 of this process will not be complete after doing it once. After a few months or lifestyle change, you will realize that you’re beginning to write things in your journal again that do not really have a “home” for. This is to be expected as we are humans whose minds and lives change with time. For example, I have been keeping journal for past five years and I still find myself repeating this process every 4 to 6 months I can take care of my brain in a structured and free flow way. Hopefully my insights will save you from giving up on keeping a daily journal. But I can say, if you put through with it, it can be one of the most rewarding things you can do for your brain and your personal growth! What Size of a Journal Should I Keep? First paragraph under section 1.. Please fix the grammar! Fixed. Thank you for calling it out. The voice recording apps are great for recording your thoughts. The #1 Destination to learn everything about the journaling habit.